Conestoga Golf Club | GolfTrip.com - Golf Tips, Vacations, Packages, Destinations and more! A golf course within the paradise – that’s how visitors describe the Conestoga Golf Club as they enter the premises of this resort and experience the beauty of nature like never before. The course designer Gary Panks created this 18-hole scenic masterpiece carefully woven into the Sun City Mesquite’s breath-taking landscapes as he described it. Gentle elevation changes, rugged rock outcroppings, and placid water elements are being preserve and protected at any cost hence providing a wonderful but natural view for golfers as they walk from hole to hole. Players of different levels get to enjoy playing in this golf vacation resort which was said to be forged by nature over time. 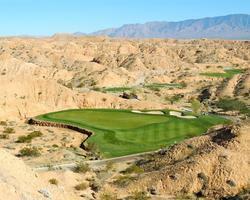 The Conestoga Golf Club is located in the heart of Sun City Mesquite just one hour north from Las Vegas, Nevada. This resort is professionally managed by Troon Golf which is famous for their excellent golf club management and customer service all throughout the golf vacation destinations operating under their management. The club harbors Cottonwood, Desert Willow, Texas Mountain Laurel, Texas Ebony, Mulga Acacia, Hybrid Palo Verde, Mesquite, and Purple Robe Locust. TifDwarf is being used for the greens while Tifway is being used on the fairways, tees, and roughs. 51 carefully placed bunkers will test the shot making skills of even the finest golfers in Conestoga. Various golf rates are being applied on different membership type and rates vary depending on the season. Peak season rate for the public is $140, $ 59 for residents, while $79 for guests accompanied by a resident. The Conestoga Golf Club also offers various golf vacation package deals to their valued clients for special events.